The Best Books Ever: New Lands (The Chronicles of Egg #2) + Giveaway! 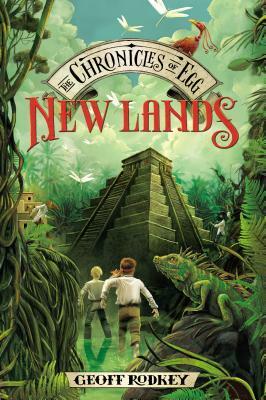 New Lands (The Chronicles of Egg #2) + Giveaway! After a narrow escape from Deadweather Island, Egg and his slightly deranged partner Guts head for the remote New Lands. They’re in search of the lost Okalu tribe, who hold the key to the mysterious treasure map that Egg can't decipher. But the ruthless Roger Pembroke is hard on Egg's trail, and the New Lands are full of new enemies—against which our heroes' only weapons are their brains, their courage...and the two dozen swear words Guts just memorized in the local tongue. They're going to need help. But who can they trust? Is Kira, the beautiful and heavily armed Okalu refugee, their ally…or their enemy? Is Pembroke's daughter Millicent on Egg's side…or her father's? Why on earth is the notorious pirate Burn Healy being so nice to them? And the biggest question of all: what shocking secret is Egg about to discover in the shadow of an ancient Okalu temple? New Lands is the second installment of The Chronicles of Egg series and it definitely still grabbed my attention from the get-go. Picking up right where book 1 stopped, we're instantly transported back into the action of Egg and Guts attempting to find the Fire King's lost treasure so that it doesn't fall into the wrong hands. New Lands is a solid continuation of Egg's story. Rodkey does an amazing job of transporting you to all the destinations that the boys encounter on their journey. This book, while not as action-packed as first, takes the boys to many new places and meeting many new people. This is where Rodkey's descriptions are truly a written marvel. This journey is more of a personal one - growth and maturity. Egg has no one, except Guts, to count on. With his maturity, he's also becoming more cunning and street-smart. (What choice does he have??) Some of my favorite sections of this book are the internal dialogues that Egg has with himself regarding Guts and Millicent. Whereas children talk out loud with no regard for what happens, he's developed a sense of who he is, the seriousness of what's going on in his life and the best courses of action for all involved. In contrast to the first book, his crush on Millicent has developed more and that also shows when he debates with himself about how he has treated her in the past, his current attitude, and where he should proceed. That was something we didn't see from him in book 1 as much, and I am very excited to see where series goes from here! While these are essentially middle-grade books (*eyeroll* I'm 29 and LOVED it), I swear to you, that no matter what age you are, if you love adventure, you will love these books! how do we enter for this giveaway?!?!!? This book sounds really good! I would so love to read this with my son!! Thank you for having an awesome giveaway! !